Progressive challenger Alexandria Ocasio-Cortez celebrates at a victory party last week. America's lawmakers skew older, and they skew male — but this year's elections may reverse that trend. And in the flood of media attention following her win, another fact about Ocasio-Cortez tends to get mentioned early and often: her age. There's good reason for that: Ocasio-Cortez is 28. If she is elected in November — and in her reliably Democratic district, there's a good chance of that — she could be the youngest woman ever elected to Congress. Currently, that honor is held by New York Republican Rep. Elise Stefanik, who was 30 when elected in 2014. America's lawmakers skew older, and they skew male. Right now, only 1 in 5 members of Congress is a woman. Of those women, only four are under the age of 40, and zero are under 30. By comparison, there were 18 men under the age of 40 serving in this Congress, according to Legistorm, a service that tracks congressional data. Women simply tend to wait until they're older to run for Congress, according to Deborah Walsh, director of the Center for American Women and Politics at Rutgers University. "The pattern has been women wait to run until their kids are a little bit older and they have a lessening of family responsibilities," she said. There are no reliable counts of candidate ages by year, Walsh said, so amid this record-breaking year of women candidates, it's hard to know exactly how big the wave of young women candidates is. But like Ocasio-Cortez, there are multiple congressional candidates under 30, meaning multiple women could break that record for the youngest female member of Congress. In addition, dozens of women under 40 have run or are running for Congress. Breaking the mold of the typical candidate can be helpful on the campaign trail. That's what Lauren Underwood, who is running as a Democrat in Illinois' 14th District, explained to NPR earlier this year. "The only people that have ever come out of our district are middle-aged white men," she said. "And so I just think there's interest in having a different voice represent our community now. The fact that I am a millennial woman of color is very different." Women candidates also are appealing to voters this year as change-makers — being a young woman can amplify a candidate's "outsider" appeal. All of that said, being young can also compound some of the difficulties that women candidates already face. "Women have an issue of credibility and being taken seriously and being seen as qualified in general," Walsh said. "We know that, from research, when you are young and you're a woman, that's even more of a hurdle." Morgan Murtaugh, a 25-year-old Republican running in California's 53rd District, says she has experienced that kind of underestimation herself. "I've had people tell me that they like where I stand on the issues, that I'm great for the party, but they're scared that I'm too young," she said. According to Walsh, young men don't face the same kind of doubts about their qualifications that young women do. "I think when you're a young man and you're running for office, you're seen as this bright, energetic go-getter," she said. "And I think when you're a young woman there's some stereotypes there about, well, 'You're new; you don't know enough yet.' "
That's one big drawback of being a young woman on the campaign trail. And there are several others: Voters worry whether mothers of young children, for example, can handle being in office and parenting at the same time. On the flip side, research has shown that voters fear that childless and unmarried candidates can't understand their lives. "No one cares about my personal life, except the older men," she said. "I've been hit on multiple times." She said she has grown used to the flirting, and that she takes it in stride as a part of campaigning. "I just smile and respectfully keep my distance," she said. That means Murtaugh has a difficult line to walk: keeping her distance from some of the very voters and donors she is trying to court. Despite all of those potential hurdles, young women do have another potential advantage: They could fire up young voters to come support them. Murtaugh, for her part, says she has been trying to appeal to young voters by talking about her concerns about the future of Social Security. Ocasio-Cortez, for her part, has campaigned on student debt forgiveness and has talked about how she still has student loans to pay off. 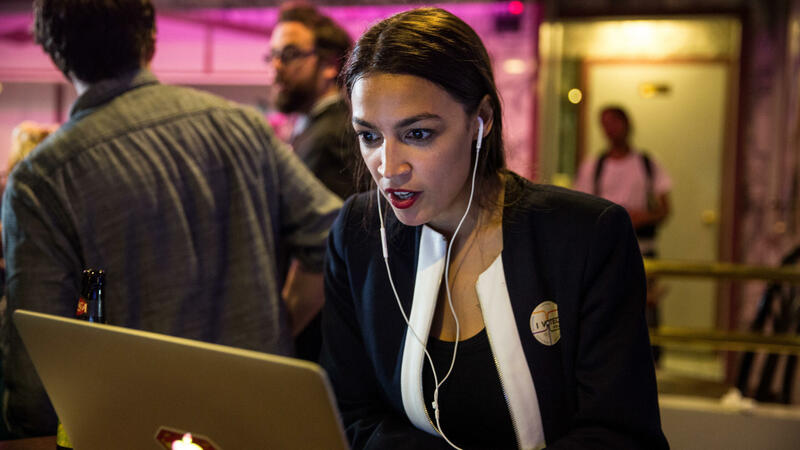 All of that may help young candidates connect to young voters, but that kind of connection goes only so far. "It's great to energize young people, but if young people don't in fact show up at the end of the day at the polls, it doesn't help you any," Walsh said. Fewer than 20 percent of voters under 30 turned out to vote in the 2014 midterms. So while young women may be particularly energized to run for office this year, their next challenge could be energizing their peers to put them into office.